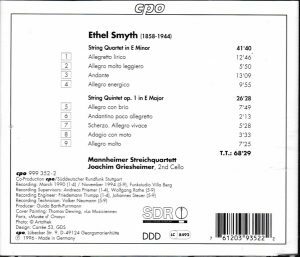 Since the mid-1990s there’s been a modest amount of Ethel Smyth (1858-1944) revival, heralded by a recording of her opera “The Wreckers” (Conifer Classics 51250, 756055125020). She seems to have been a strong personality, strong enough to oppose her father’s refusal to let her embark into serious studies to become a composer (and it certainly takes a strong will to oppose a general-major of the Imperial army), and later to get arrested and emprisoned for her all-out and unbridled advocacy of women’s rights. Her training was principally German: she studied with Carl Reinecke (1824-1910) in Leipzig and became very close to Heinrich Herzogenberg (1843-1900), a close friend and admirer of Brahms – both composers were considered the crème de la crème in the mid- to late 19th century German world but are now seen as second-rate composers who wrote for way too long music anchored in the style of their predecessors. There may be nothing strikingly new or entirely original in the music of Smyth here, but both works are absolutely charming, all-out lyrical and songful, magnificent even in the Andante of the String Quartet, in a style that sounds, to my ears, close to to early Dvorak rather than to Brahms (there’s the sunny and carefree lyricism of the former, but not the tonal density of the latter). The liner notes speak, somewhat condescendingly, of some “longueurs” in the Finale of the Quintet: I don’t hear them at all. While the Quintet is an early composition, the String Quartet is an extended work, running here over 40 minutes, with beautiful and intricate part-writing and a wealth of imagination in the developments. I’d need to listen again to the quartets of Smetana, Tchaikovsky, Taneyev et al. 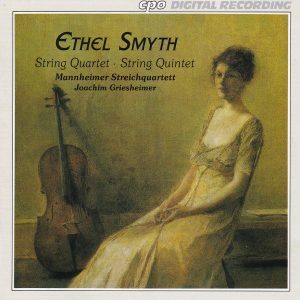 to check if some reminiscences are valid, but the point here is to say that, come up with whoever wrote arch-lyrical and melodious string quartets at the end of the 19th century, Smyth’s own is equal to theirs. I won’t even hold it against Smyth that she writes in a romantic style that may appear conservative. The Quintet, an early work for her, was written in 1884, which corresponds to late Brahms (he wrote his own first Quintet in 1882), and I find it very permissible for a still budding composer to be inspired by earlier models. As for the String Quartet, it was published in 1914 (and presumably written from 1902 to 1912); that’s a year after Mahler’s death, and it doesn’t sound all that backward looking compared to the music of Mahler; at times, while listening, I fancied what might have been a string quartet of Mahler, Mahler without the orchestral attire, stripped to the bare essentials of four strings (and the Adagietto of the Fifth Sympony or the Finale of the 9th can give faint clues of what it might have been). I don’t know yet how Smyth’s compositional style later evolved. She died in 1944 and I doubt that she made the evolution from Mahler to Schoenberg. The same works written had the end of her life might, indeed, have sounded hopelessly backward-looking, but not so much 30 to 50 years ealier. Anyway a look at her catalog of compositions shows that she didn’t write much that was significant thereafter in chamber music, and busied herself mainly with opera.But I’ve found much enjoyment listening and listening again to this disc, first casually, then precisely, following with score, both available from IMSP, gratitude again to who uploaded them: String Quartet is here and String Quintet here (links will open .pdf file in a new tab). Tentatively, in absence so far of recorded comparison available to me (it exists, by the Mendelssohn Quartet, on Troubadisc CD-01403, barcode 4014432014036 – and I’ve immediately ordered it), the Mannheim Quartet seem to play superbly, with tonal luster and great responsiveness to the details of dynamics and tempo.